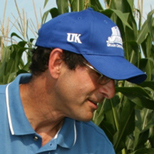 Paul Vincelli is Provost's Distinguished Service professor at the University of Kentucky. His specialties include epidemiology and management of crop diseases, molecular diagnostics, and international agriculture. In recent years, he has provided outreach on genetic engineering of crops. He is UK’s coordinator for the USDA Sustainable Agriculture Research and Education program, and is a councilor-at-large for the American Phytopathological Society.